Archetypes, I am told, are instinctual psychological patterns of behavior within our collective unconscious. However, an archetype remains ‘merely’ a potential pattern of behavior until an actual event or experience in an individual’s life activates its energy in the psyche. Once activated, these energies become so powerful that they shape the way we perceive the world. And, while archetypes are considered to be collective drives, they are experienced and expressed by each of us in our own personal ways. 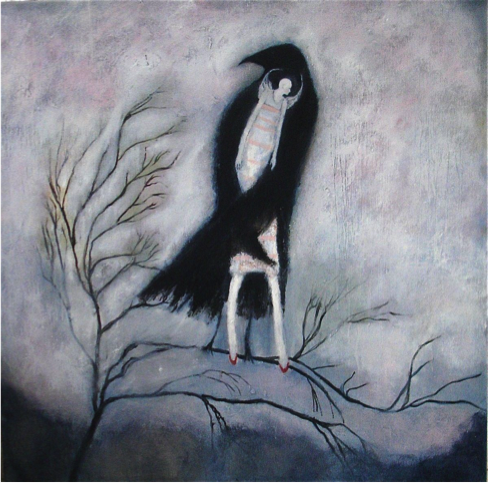 We connect to animal archetypes—known as totems—through synchronicities, dream encounters, active imagination, close encounters in nature, mythology, and art—as evidenced by this powerful painting entitled “Fledgling” by artist Jeanie Tomanek. According to indigenous peoples around the world, animal totems are sources of power and wisdom for a human being. A person’s totems (we can have more than one) are the animals we feel the most attachment to through the archetypal qualities they invokes in us, and are those that appear most often to us to impart their lessons. Several of the better-known animal archetypes are Crow/Shape-Shifter, Coyote/Trickster, Snake/Change, Owl/Death, Elephant/Trail Blazer, and Hawk/Far-Sighted. Each of these animals can also represent other archetypal energies in a person’s psyche besides the ones I’ve listed here from my own understanding and experience. For years, I have encountered animal totems in my waking and dreaming life. From these experiences, I feel connected most closely to the energies of Crow, Hawk, Wolf, Bear, Dolphin, Elephant, and Dog. When an event of synchronicity with Hawk occurs—for instance, I am in a muddle about a situation, turning it over and over in my head as I walk along, and all of a sudden I become aware of Hawk circling overhead—I know immediately that I need to step back and look at the problem from a ‘higher perspective.” That there is something I’m missing of importance in my myopic view of the situation. A friend of mine and I are both Crow people, but we experience its totem energies in different ways. Crow brings my friend messages on her path on a regular basis and has been instrumental in guiding her to her “true purpose in life.” Crow talks to me primarily during times of transformation and transition, as when a loved one is passing from this realm to the next. Since I personally experience totem energies most often in events of synchronicity, I’d like to share a cluster of meaningful coincidences that occurred around the archetype of Owl. My brief connection to the Owl archetype began to take shape the day I read author Frank Joseph’s account of the huge pre-Incan Owl-headed figure carved on the side of a Peruvian cliff: “With its right hand it points at the sky, while its left hand gestures toward the ground, implying the soul’s flight from Earth to heaven.” The image fully caught my imagination, and I made a mental note to visit this ancient site if I were ever in that part of South America. The next afternoon, my friend Anna’s son Michael was pressure washing my back deck when a baby owl came to perch by him on the privacy fence surrounding my yard in St. Petersburg, Florida, where I lived at the time. The young bird sat there for several minutes amidst the noise and spray of the machine, watching Michael work. We both found this incident strange since neither of us had ever seen an owl before in our suburban neighborhood. That, and the fact that owls are nocturnal and rarely make an appearance in the daylight hours, made me count this as a synchronicity connected to my reading about the owl etching the day before. When reflecting on the meaning of this coincidence, I realized that the idea of the “soul’s flight from Earth to heaven” could well be applied to Michael’s owl sighting since his father, Keith, had died just 10 months earlier. Later, when I told his mother about the event, Anna stated that she didn’t know if Michael’s owl experience could be construed as a soul message from his father, but that there was definitely a connection going on since she had placed a wooden owl on Keith’s headstone, unbeknownst to Michael, as a protection from negative energies just days before! 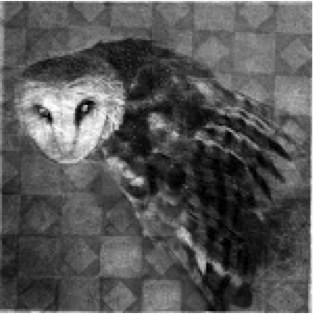 These voices of Owl remind me at this time of Winter Solstice 2012 that within the Dark is the seed of Inner Light; within the archetype of Death is Rebirth.